This morning at 3 am I couldn’t sleep so I decided to get up and bake! Yes, me the person that never bakes. 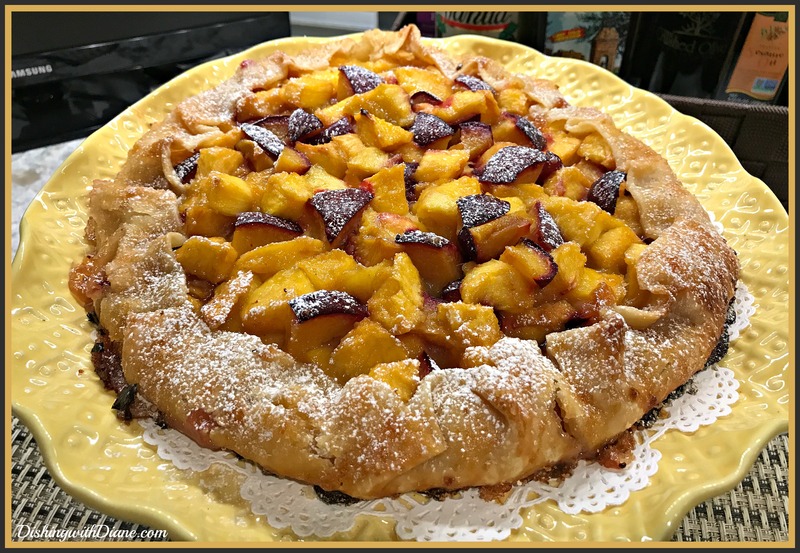 We had some peaches and plums and I always keep an “emergency” prepared pie crust in the house; so I decided to make a crostata. For those of you who aren’t familiar with a crostata, it is an Italian baked tart. Also know as a galette in France. This is the type of baking I can do; quick, easy and always delicious. The perfect breakfast with a cup of coffee or tea. Once again, I posted the picture to Dishing With Diane Instagram page and requests for the recipe started to pop up. 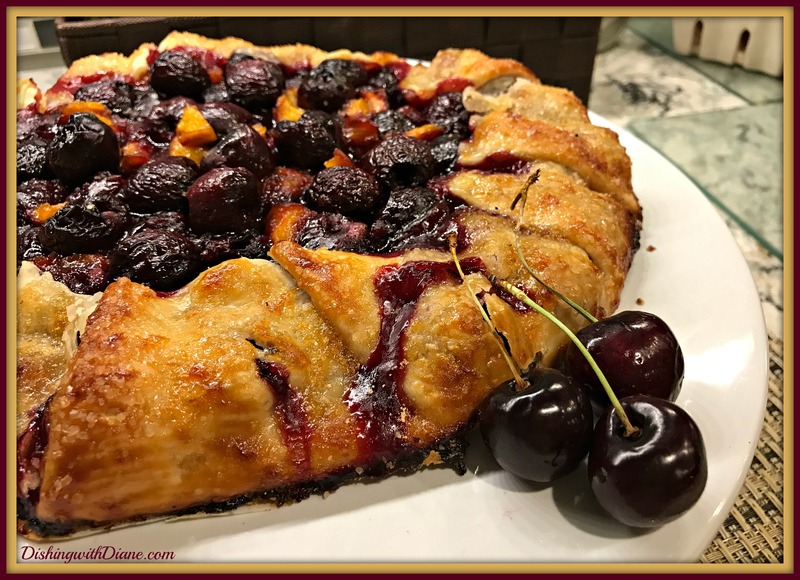 So the recipe is printed below along with a recipe for homemade pie crust if you don’t like store bought and a photo of another crostata I made with cherries. Prepare a baking sheet by lining it with parchment paper. Set the uncooked pie dough onto the baking sheet. In a bowl, gently mix peaches, plums sugar, and flour together. Pour fruit mixture into the center of the pastry round, leaving about 2 1/2 inches around the edge. Fold up the edge of the pastry dough over the filling to make a rim. Fan the edge as you go around folding the dough. Brush pastry with the beaten egg OR the jam & water and sprinkle edges with sugar in the raw. Place the pat of butter on top of the fruit mixture. Bake for 30 to 45 minutes or until the pastry is golden brown and the fruit is bubbling. Cool the crostata on a rack and serve warm or at room temperature with your favorite ice cream. 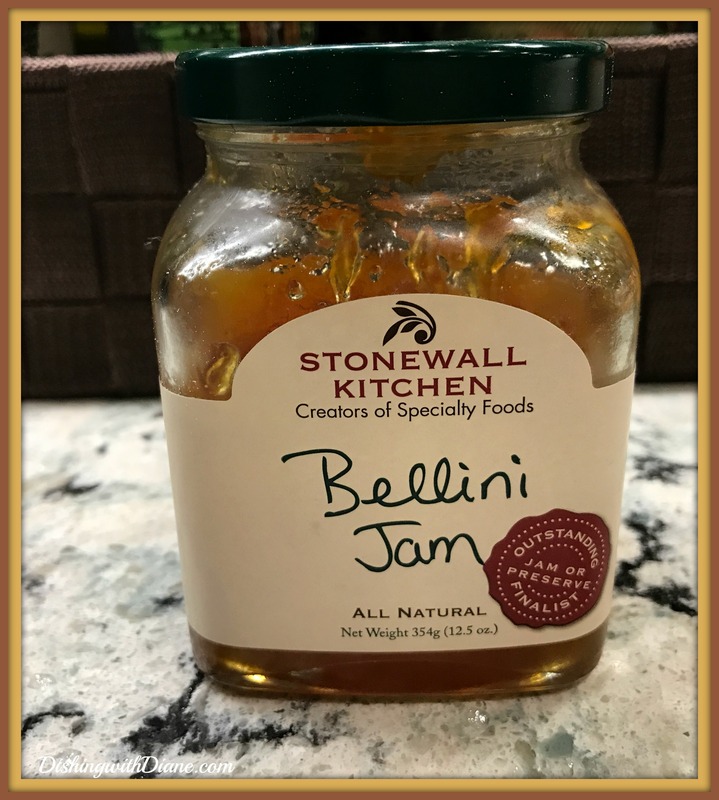 I used Stonewall Kitchen Bellini jam* for this crostata instead of the egg or apricot jam. You can change the fruit as you like. I also made a cherry crostata with this recipe. In a food processor, briefly pulse flour, salt, and sugar. Add butter; pulse until mixture resembles coarse meal, with a few pea-size pieces of butter remaining. Sprinkle with 2 tablespoons ice water. Pulse until dough is crumbly but holds together when squeezed (if necessary, add up to 2 tablespoons water, 1 tablespoon at a time). Don’t over mix. Turn dough out onto a large piece of plastic wrap. Fold plastic over dough; press to shape into a 1-inch-thick disk. Refrigerate until firm, at least 1 hour (or up to 3 days). On a floured piece of parchment paper, roll dough to a 14-inch round with a floured rolling pin. Wrap dough around rolling pin, discarding paper; unroll over a 9-inch pie plate (opposite). Gently fit into bottom and up sides of plate (do not stretch dough). Using kitchen shears, trim dough to a 1-inch overhang. Fold under itself to form a rim, and press to seal. Using thumb and forefinger, crimp rim of crust. Refrigerate until ready to use, up to 1 day. This entry was posted in Desserts on September 2, 2017 by aries041158. 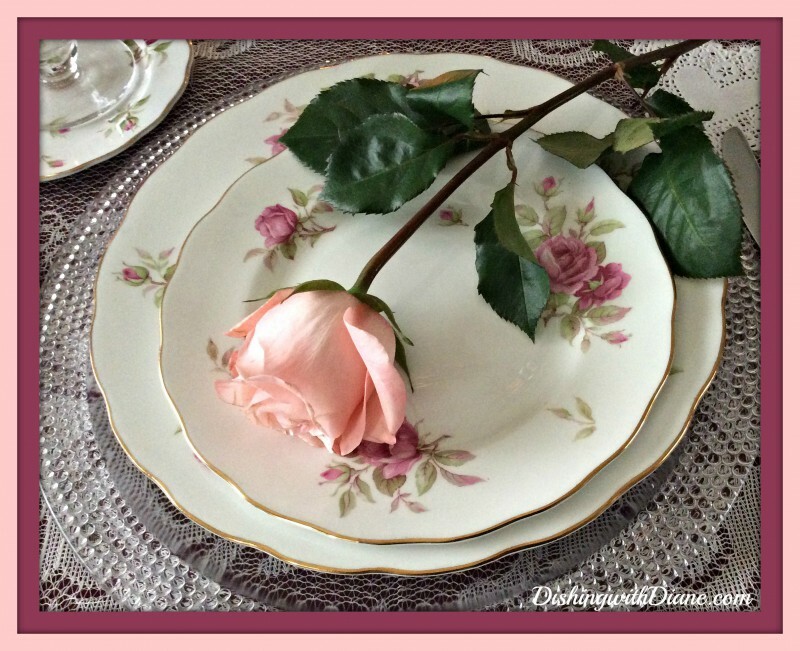 You will love it and it is so easy to put together.